SAN DIEGO (LOG News Service) — The next America’s Cup will be contested in radical, single-hull boats that will rise up on hydrofoils and speed across the tops of the waves. 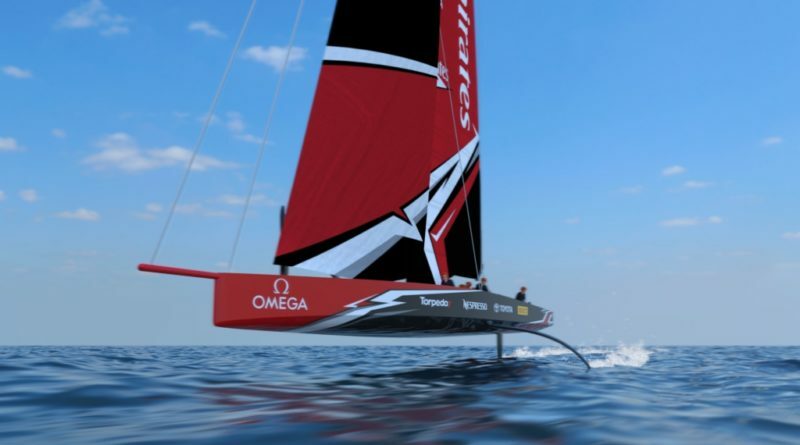 America’s Cup champion Emirates Team New Zealand, always bold in pushing the envelope of yacht design, unveiled the concept for a fully foiling monohull for the 2021 regatta in Auckland. The 75-foot boat, designed in conjunction with Challenger of Record Luna Rossa of Italy, will use twin canting T-foils to help lift the hull completely out of the water in order to increase speed. The foils will be ballasted to provide righting moment when sailing, and roll stability at low speed. The AC75 will not have a keel. The AC75 will replace the AC50, a 50-foot foiling catamaran used in the 35th America’s Cup earlier this year in Bermuda. In the normal sailing mode, the AC75 will skim above the waves on the leeward foil and rudder, with the windward foil raised out of the water to reduce drag. Both foils can be lowered in pre-starts and through other maneuvers to provide extra lift and roll control, which also will be useful in rougher sea conditions. Many more details are still to come, including cost, the type of sails and how the foil movement will be powered. ETNZ said there would be an element of one design to keep the costs down. The class rule will be published by March 31, 2018. Team New Zealand said the AC75 would provide for great match racing with the safety factor of being able to right itself if it capsizes. Entries for challengers open Jan. 1, 2018 and close June 30, 2018. The New York Yacht Club, which once held the Auld Mug for 132 years, announced it would challenge.